Mesoestetic Cosmelan Treatment is a depigmentation method trusted by thousands of aestheticians and millions of patients worldwide used for removing hyper-pigmentations caused by melanin while simultaneously regulating the over-production of melanin in melanocytes. This corrective and regulating action helps stop and control the reappearance of new spots therefore achieving short and long-term results to keep hyper-pigmentation under control. 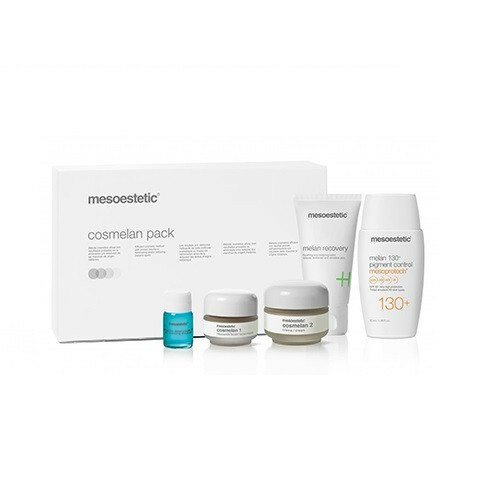 More than just a treatment the Cosmelan is a complete skin care method, inclusive of a single peel session followed by a strict home maintenance skin care regimen. The maintenance period occurs over a 12-month period in order to achieve the best results and prevent the reappearance of spots. I have personally used Cosmelan 2 to help with my pigmentation and it is without a doubt the most effective product on the market right now. It will cost you a fortune but it is worth every cent to be able to walk out of the house with no make up on!